The OBJECT to Be Regarded. A godly mother’s law. O what a privilege to have a godly mother! One who knows . . .
the power of vital piety in her own heart. Such a mother will teach her child . . .
to prepare for the future and eternal. In a word, she will enforce on her child the advice of the Savior, “Seek first the kingdom of God, and his righteousness.” The salvation of the child’s soul — will be nearest her heart. The early and entire consecration of her child to God — will be the object at which she aims. For this she will teach, and pray and act. Nor will less than this, ever satisfy her maternal mind. Every child should . . .
and endeavor to carry out a mother’s wishes. The TEMPTATION to Be Resisted. When young people leave home, and enter into a place of business, or some school to learn a trade, or a profession — they find themselves surrounded by new circumstances. They often fall in with new companions, and are plied with new temptations. Away from home, away from under a mother’s eye, out of the reach of the sound of a mother’s voice — they are apt to forget thelaw of their mother. They once thought that they never would, never could — but they do! Not only so, they are tempted to forsake a mother’s law, and adopt a new and untried rule of life, perhaps the very opposite to that which their mother gave them. Think of a mother’s love — so strong, so tender, and so constant. 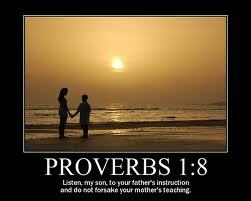 Think of a mother’s wisdom — implanted in her heart, by your mother’s God. Think of a mother’s concern for her child — how deep, how lively, how uninterrupted. A child may forget its mother — but the mother will never forget her child. The child’s interest in its mother may die out — but the mother’s interest in her child never will. A mother’s love — is an undying love. A mother’s wisdom — is quick and inventive. A mother’s concern for her offspring — is as lasting as her life. Think of meeting your mother before God in judgment! Then her lessons will all be revived in your memory — then her prayers andtears will come up before you anew. Then she will rejoice in your salvation — OR acquiesce in the sentence of the just judge, when he bids you to depart from him into everlasting fire, prepared for the devil and his angels! Yes, your mother will acquiesce in what is just, even in the eternal condemnation of her child — as a hardened, persevering rebel against God! O how solemn the thought — a mother obliged to agree to the banishment of her child from God and eternal glory — unto eternal Hell! Think of having the image of your mother — a holy mother, a glorified mother — stamped upon your memory forever in Hell. Think of hearing that tender, touching voice — warning, entreating, and beseeching you to flee to Jesus — stamped upon your mindforever in Hell. Think of having the law of your mother, and the efforts of your mother to save you — ever before you, when all hope is gone, and every way of escape is barred, and barred forever! Think of how you may now add to her joy, by deciding for God; OR increase her sorrow, by going on still in your trespasses. By the horrid thought of being . . .
Few realize the value of a mother as they should, while they have one — especially a godly mother. But when death has done its work in her, when her soul has departed, to look at a mother’s corpse, to follow the coffin that contains a mother’s remains, or to stand by a mother’s grave — will awaken strange thoughts, new feelings, and perhaps bitter regrets. While you have a mother — love her, obey her, and make her heart glad. Many forget and forsake the law of their mother, when away from her. This is unwise, it is unkind, it is ungrateful. A mother’s advice . . .
often the result of the most earnest fervent prayers. — too many of our young people forsake the law of their mother! Many will wish — but wish in vain, that they never had such a mother! will give intensity to the bitter pangs generated by hopeless despair! The thoughts of what their mother was, what their mother did, and how their mother tried to prevent their ruin — will make Hell ten times hotter than it would otherwise be — to many a child of godly parents. But on the other hand, many will bless God forever for . . .
and that law — constrained the soul to bow to the scepter of Jesus, and trust alone in his blessed name. Young friends, endeavor to realize the value of a godly mother, while you have one! Never, never, let anyone, or anything tempt you to forsake her law — lest in Hell you should bitterly and eternally regret it! But let a mother’s love, a mother’s example, and a mother’s law lead you at once to Jesus — that you may meet your mother with joy at last, and dwell with her in Heaven forever!